Polish FM says denial of Holocaust violates laws, 'Hitler expert' tour guide won't be allowed in. Holocaust denier David Irving will not be allowed to enter Poland or lead tours at Nazi death camps, Polish Foreign Minister Jacek Czaputowicz told a press conference. 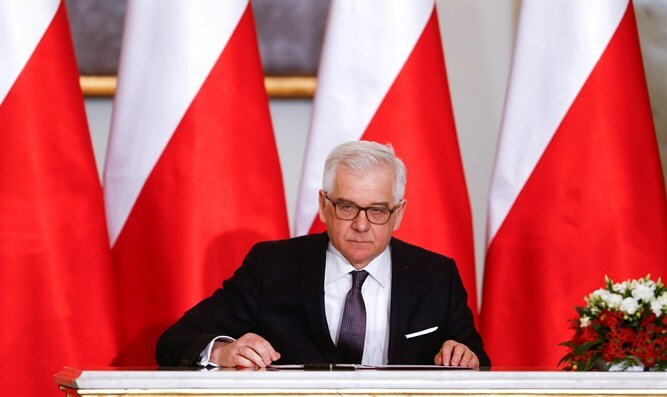 "Polish law forbids denying and negating the Holocaust, and therefore we cannot accept him in Poland, if he intends to come in order to express his views," Czaputowicz said. Irving told Reuters that he intends to visit Poland together with tour participants later this year. Irving, who has described himself as a "Hitler expert," was scheduled to lead a nine-day tour of visit Treblinka, Sobibor, Belzec and Majdanek. Earlier this week, Israeli Education Minister Naftali Bennett requested the Polish government deny Irving entry, since the tour "will doubtless cause deep offense to the memory of the victims of the Holocaust and to all the Jewish people, as well as stoke the already raging fire of hatred and antisemitism we are witnessing around the world today." Irving lost a libel suit he brought against Holocaust historian Deborah Lipstadt in 2000. Initially, he claimed that Hitler was not aware of the program to exterminate the Jews. He later began to deny the Holocaust outright, claiming, among other things, that there is no evidence to prove that Auschwitz's gas chambers ever existed.